User can prioritize the stories in Defect Backlog by dragging them up and down. The action menu supports three options to move user stories. To move up a user story go to the action menu and click on move to top. Click on the user story to place it on the top of the list. 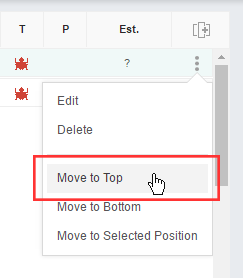 To move down a user story go to the action menu and click on move to bottom. Click on the user story to place it in the bottom of the list. 1. Go to the action menu of the story you want to move. 2. 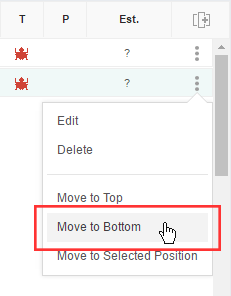 Click on Move To Selected Position. 3. Select the desired position with in the pop up. On click of save the story it will be re-positioned.